This research aims to verify a proposed link between the worldwide outbreak of wars since 1700 and the Cyclic Index of Barbault. To make a clearer distinction this has been supplemented by two sub-indexes. The three indexes created in this way are respectively called the Uranus, Saturn and Jupiter wave; each has its own rhythm, unique to the respective planets after which they are named. 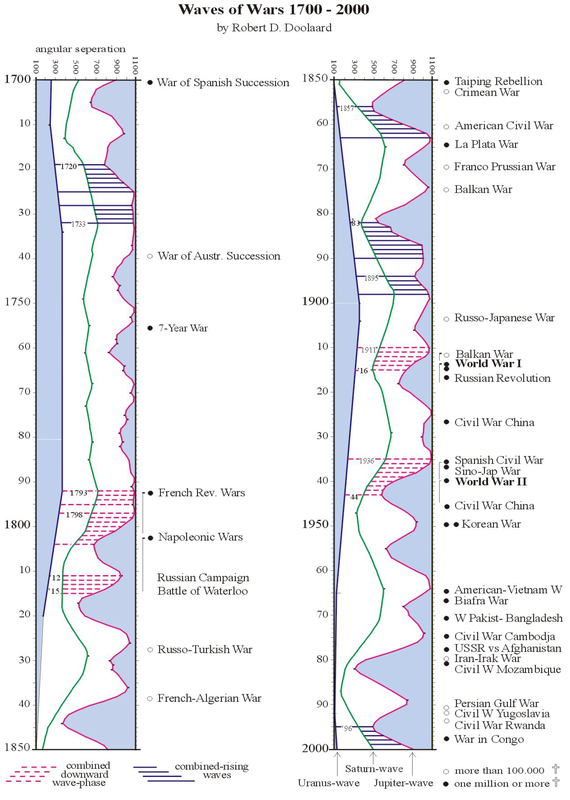 A chart of 61 great wars is presented, complete with phase notes for each of these three waves. The result is the ‘Catastrophe Effect’ i.e. the worse the war, the stronger the link with all three waves. The great wars between 1500 and 1700 have also been included as supplement to this research. Subsequently the Catastrophe Effect is once again illustrated by means of examples from history, commencing with the collapse of the Assyrian Empire. In conclusion, the material is further examined through a test proposed by Professor Suitbert Ertel. Also the relation of mundane astrology to historicism is discussed. This research material was first published in 1993, in the Astrological Journal, in Symbolon and in the sceptical Dutch scientific magazine Astrology under Scrutiny. The latter submitted it to three referees. The editorial staff found it an interesting observation but could not agree with my conclusion and was of the opinion that it could be founded on coincidence. A deep silence followed and my work seems to have passed into oblivion in the English-speaking world. I began this research to provide quantitative proof for my planetary-cyclical historiography, published in 1986, in Dutch, under the title Waves: Planetary Influences on Culture 600 BC – 2000 AD. A summary of this book, in four parts, was published in the Astrological Journal of Britain (Doolaard 1990-91). An English translation was then in preparation and was to be published by the Urania Trust, on the initiative of Charles Harvey, who was enthusiastic about my work (see Mundane Astrology, second edition 1992, page 218, ref. 55). Through his regrettable decease and other circumstances beyond my control, this never materialised. In 1993 I stated: “Now democracy is spreading, especially since the authoritarian Communist regimes began to dissolve, we are able to harbour some hope, since history teaches that democracies are extremely less blood-thirsty than totalitarian regimes.” Since 2003 we realize that even modern democracies do not hesitate to start a war on the basis of fabricated information, therefore putting aside the carefully constructed international legal order. In common with the First Gulf War this one also broke out at the start of a descending phase of the Cyclic Index. The following text is alike to that of 1993, only abbreviated when possible, with minor adjustments and brought up to date. Subsequently I include additional proof with relevant commentary. Our division of time is related to the rotation of the Earth around its axis and to its orbit around the sun. It is only a small step further to extend this to all the planets in our solar system. The characteristic feature is the circular movement, the cycle. Just as a twenty-four hour period is divided into a day and night half, and a year into a summer and a winter, so we are able to perceive a difference in the cycle of two planets, a waxing, outgoing half (from conjunction to opposition) and a waning, incoming half (from opposition to conjunction), each with its unique character. The cyclic vision of time is very old, probably as old as human observation. During the Greek Classical Era, new life was breathed into this vision by e.g. Pythagoras, Heraclitus, Empedocles, Plato and Aristotle. The rediscovery of cycles in astrology, with directions for practical application, is from more recent date. The first publication about cycles of planetary pairs, within a psychosocial context, was from Th.J.J. Ram (1935). The inspiration was from his friend Thierens (1933). The most important element consisted of the recognition of a qualitative and dynamic contrast between the outgoing and incoming half. The first (really brilliant and inspired) article that I read (in 1963), from André Barbault, described the succession of historical events in e.g. the Soviet Union as compared to the succession of aspects between Saturn and Neptune. Therefore cyclic but without any special qualitative differentiation between outgoing and incoming aspects. Later on he rediscovered Gouchon’s Cyclic Index and fully demonstrated the possibilities of the Cyclic Index in his L’Astrologie Mondiale (1979). Barbault told me later that he had met Ram (“un charmant homme”) but did not remember their topics of discussion. There have also been interesting publications in the English language about cycles, from Dane Rudyar (1971) and, of course, the historical, philosophical and practical observations of Michael Baigent, Nicholas Campion and Charles Harvey in Mundane Astrology (1984). Of great importance is The Great Year from Campion (1994), an inventory of all concepts of time in western history. It is really thanks to a brainwave of the French astrologer Henri Joseph Gouchon, (Barbault 1973, 1979, Harvey 1984) and its rediscovery and propagation by André Barbault, that the cyclic concept has become a serious consideration in astrological research. During the Second World War Gouchon as well as Barbault settled down to solve a serious problem that had arisen. Not a single astrologer had been able to foresee that approaching catastrophe (Harvey 1984). Gouchon then conceived the idea of calculating the zodiacal distances (angular separation) of the 10 cycles made by the outer 5 planets (thus from Jupiter to Pluto) with one another. He then added up these 10 angular separations. He did this once for each year (on March 21), plotting the results on a graph. Through connecting these points with each other, an undulating line took form, showing the average movement of the combined cyclic phases of these 5 outer planets. The wave pattern is always dominated by the fastest planet, in this case Jupiter. When the line goes downwards Jupiter is moving towards its conjunctions with the slower planets (incoming or downwards phase or wave). When the line rises, Jupiter is moving towards its oppositions (outgoing, or upwards phase). Gouchon called this “l’indice de concentration des planètes lentes”, (Barbault 1973). It was soon evident to him that the First as well as the Second World War took place during the incoming, downward phase of the Cyclic Index. On this basis he predicted that before 1950 there would be no great war. In 1950 the Korean War broke out (Harvey 1984). Those astrologers (Barbault 1973, 1979, Harvey 1984), who have studied the Cyclic Index in depth agree that it provides a good indication of the degree of stability in international economic and political relations. Recent history provides ample illustrations. In the second half of the 70’s, during the downward phase of the Cyclic Index, the enlightenment of the Sixties came to a halt; the (world) economy gradually became bogged down by inflation, bankruptcy, and fast-rising unemployment. At the same time international relations deteriorated following the Killing Fields of Cambodia, the fundamentalist revolution in Iran, the invasion of Russian troops in Afghanistan and the war between Iran and Iraq. It was a period of great cynicism and defeatism. Only from 1983, as the Cyclic Index is rising, did the economy gradually improve. International tensions lessened as well, especially following the rise of Gorbachev and his efforts for reform (glasnost and perestroika). Having arrived at the wave crest of ’89/’90 East European communist dictatorships collapsed (predicted by Barbault in an article published in 1955! (Barbault 1990), followed by the disintegration of the Soviet Union and the Civil War in Yugoslavia, whilst at the same time the political situation (Persian Gulf War) worldwide worsened. During the following upward phase the economy was booming again and the stock markets reached an incredible peak primarily brought about by the technology funds (New Economy Boom). With the opposition of Jupiter to the outer planets (to Pluto in 2000) the stock markets crashed and at the opposition of Saturn (to Pluto in 2001) an end came to the international political stability with the attacks on the Twin Towers and the Pentagon. During the present downwards phase of the Cyclic Index (since 2003) the international situation looks grim. The upward phase of a period marks a dominant optimism, relative stability, creativity and growth. The downward phase corresponds to a period of involution, destruction, pessimism, confusion and relative chaos. While this is a somewhat simplified representation of facts, it is adequate for this study. The question now is whether the outbreak of wars confirm this hypothesis, because if there is a correspondence then more, or more severe, wars break out during the downwards than during the upwards phase of the Cyclic Index. Firstly I wish to explain how the graph (fig.1) evolved. 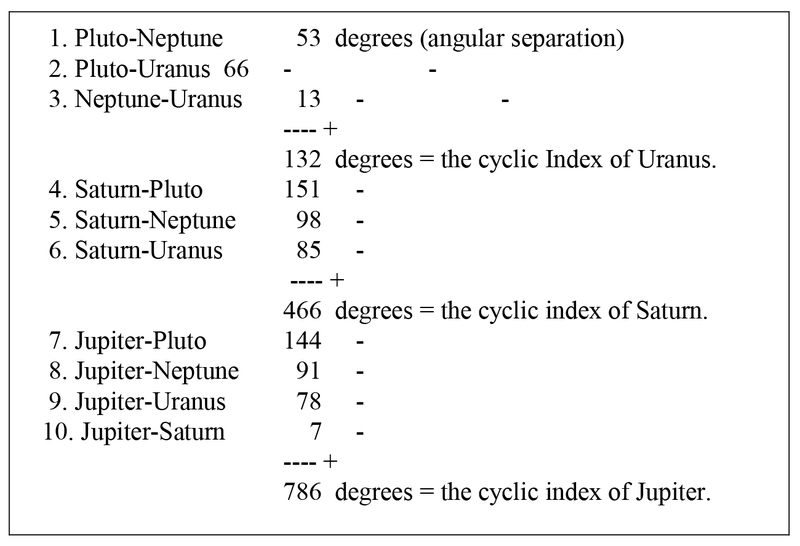 I have included the cyclic indexes for Uranus and Saturn. The reason will become apparent later. All the (geocentric) calculations are made for March 21 of each year. The programme used for the position of the planets is Astrocalc from Collin Miles. All computations are done by hand and drawn in Corel Draw. Taking 2000 as an example, we begin with the cyclic index of Uranus. To achieve this, firstly the distance (angle) is calculated between Pluto and Neptune, that is, 53 degrees. To this we add the angular separations of Uranus-Pluto and Uranus-Neptune, respectively 66 and 13 degrees, obtaining a total of 132 degrees. The graph begins at 100 degrees; a point is set for Uranus at 132. I possess two list of wars. The first one compiled by the French historian, Bouthoul (1976), Barbault kindly sent me. This list ran from 1740 to 1974. Then I took up contact with the Dutch Polemological Institute at Groningen University and the Centre for Research of Social Conflict at Leiden University. They provided all the necessary data. The list I am using: “Wars and War-Related Deaths, 1500-1990”, is compiled by William Eckhardt, Research Director of the Lentz Peace Research Laboratory, published in “World Military and Social Expenditures 1991”. For the period 1700-1991, 491 wars are listed, in each of which 1000 or more deaths are recorded (military and civilian). In these wars about 135,000,000 people lost their lives. Imagine, that is as many as the total population of Europe in the middle of the 18th century, or as many as the present population of the British Isles, France and the Netherlands together. the upward Jupiter wave (plus-phase). Here we can see that wars from the first two categories slightly more often break out during the outgoing, upward, phase than during the incoming, downwards phase. Here also the differences are not so great and fall within expectations of coincidence. Let us now consider the great wars. The plus signs and minus signs under the planets show the phase (- means downward and + means upward) in which the various waves are moving. Under Uranus there are two notations. The first one is for the phase with Pluto, the second for the phase with Neptune. See end note 2 about ‘predominant’ and ‘half’. See end note 3 for the time span the waves are in the – or + phase. In the 61 great wars listed above, the relationships are much clearer. 40 break out during the descending and 21 during the ascending phase of the Jupiter wave. That is a ratio of 2:1. The same ratio applies to the Saturn wave. Also, during the simultaneous descending phase of the Jupiter and Saturn waves, wars break out 4 times more often (26 : 6) than in the reversed situation. However, if we compare the number of death felled in wars beginning in the descending phase with those beginning in the ascending phase of the Jupiter wave, we arrive at a ratio 12:1. Since this group of great wars is responsible for 92 % of the total number of deaths in all wars of this period, I consider that an extraordinary result. From this group 66% (85.250) die in 9 % of the time (27 years) in wars beginning when the Jupiter-, Saturn- and Uranus waves are all simultaneously on the descent, which is 27 times more than in periods when they are all rising. It becomes even more interesting when we take those wars from the above list which resulted in a million or more victims, the mega-wars. 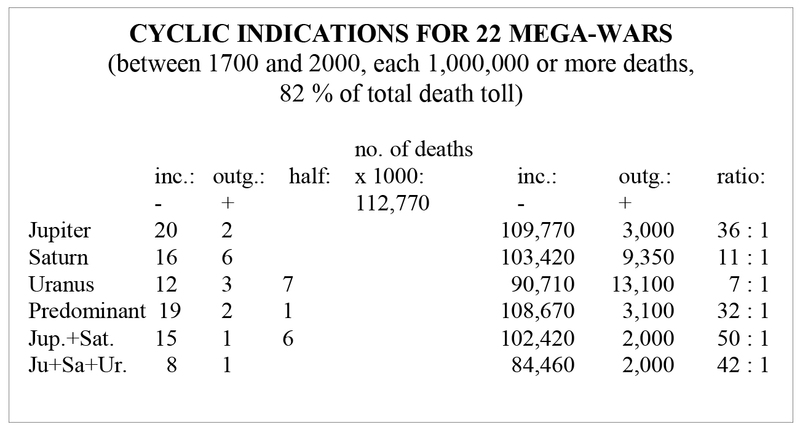 Here below is a list from which you can see that these terrible wars cost 82% of the total death toll. An overwhelming number of these 22 mega-wars began during the descending phase of all the waves and groups of waves. All these mega-wars started, except two, during the downward Jupiter wave, in which 36 times as many deaths occurred as in the two mega-wars that began during the upward phase. Since this group of wars is responsible for 82 % of all the deaths in our research, the outcome here is also striking. It will now be clear why I include not only the cyclic index of Jupiter, but also that of Saturn and Uranus. If you ask a historian which events have formed the greatest threat to the continuation of European civilisation in the last three centuries, then he would certainly answer: the Napoleonic Wars (1803-1815) and the two World Wars. These three disasters have in common that they each broke out during a downward wave phase of Jupiter, Saturn and Uranus simultaneously. It almost engulfed us. This shows that these waves, in a similar phase, greatly strengthen one another. This effect corresponds to similar findings in the interrelated cycles of Pluto, Neptune and Uranus (Doolaard 1986, 1991-2). We can recall from the PlutoNeptune cycle that in the period between the end of the prolonged incoming trine and the beginning of the following prolonged outgoing sextile of these cycles (for the last time between 1793 and 1943 i.e. from the Reign of Terror until the turning-point in the Second World War) civilisation went through a deep abyss. That has happened 5 times before, every 500 years, which any historian is able to confirm. Nevertheless we have risen 5 times from this deep trough in the Pluto-Neptune cycle during the subsequent prolonged outgoing sextile. In history all these periods correspond with heydays in cultural development. They have all been endowed names with the predicate “classical” or “renaissance”, beginning with the Golden Age of Pericles! (Doolaard, 1986, 1990-1, 1997). To return to our study, we can clearly see that the more terrible our wars are, the greater the tendency for them to break out during the descending phase of the three waves. The fact that twice as many wars break out during the descending than in the ascending Jupiter phase, means that even during the ascending phase we should be on the alert. That is contrary to our experience. I have looked into the reason. On the list of 61 wars there are 19, which occur in Europe. These are marked with two dots instead of one after the number on the list of 61 great wars. 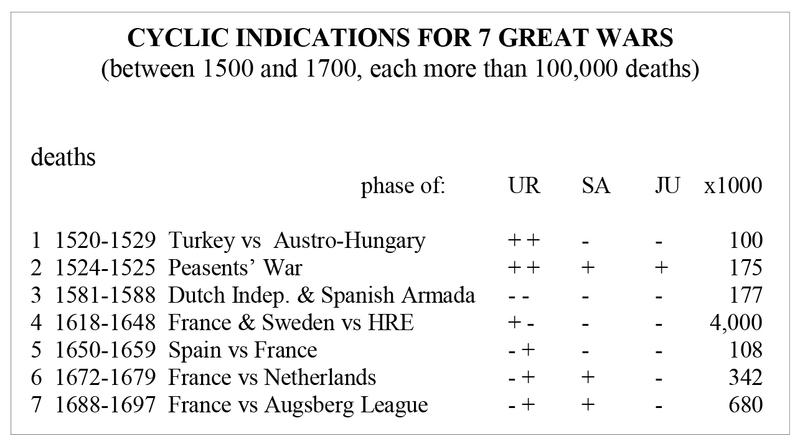 16 of these 19 wars, the consequences of which were not always limited to Europe, begin during the downward phase and only 3 during the upward phase. This no longer gives a ratio of 2:1 as in the 61 great wars, but 5:1. The ratio between the number of deaths in these European wars beginning in the descending Jupiter phase and those beginning in the ascending Jupiter phase is more than 100:1. It’s important not to forget that in this whole period of 300 years the Jupiter-Saturn and Uranus waves only descend simultaneously for 27 years, and ascend together for 35 years. In 7 of the 19 great European wars which broke out in 9% of the time that these 3 waves were simultaneously descending, 93% of the deaths occurred. We see here that the two World Wars form no exception. All the European mega-wars show a clear relationship to the descending phase of all the waves and groups of waves. 1. Smaller wars can break out at any unwelcome moment, regardless of the cyclic index phase. 2. In contrast 89 % of the total number of victims falls in wars, which begin during the downward Jupiter wave. 3. The main reason for this is that from the 22 mega-wars, responsible for 82% of the total death-cipher, 20 break out during the downward Jupiter wave, responsible for 97% of the losses in this group. 4. 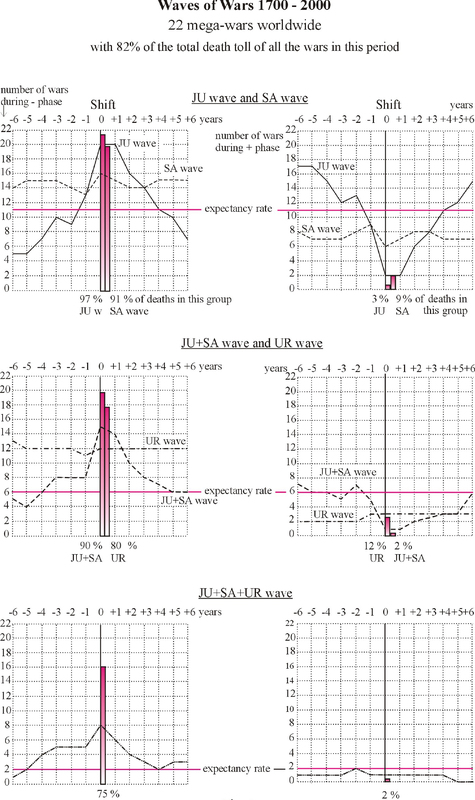 In these 22 mega-wars 96% of the victims died in the 19 wars that broke out during a prevalence of descending wave phases, and 75% in wars beginning when all three waves were on the descent, which was only during 9 % of the time. 5. The worse the war, the more often it breaks out during the downward phase of the cyclic indexes (Catastrophe Effect). 6. For an as yet unknown cause great wars in Europe break out relatively more often during the descending Jupiter phase than elsewhere in the world. As many as 143 times so many deaths occur here in wars beginning during the downward Jupiter wave than in those beginning during the rising Jupiter wave. In fact 93% of them die in those wars, which begin in the 27 years (9% of the time) in which the phase of these three waves are descending at the same time. The group of 9 European mega-wars, in which 97% of the deaths in all the great European wars occurred, reveal such a clear relationship to all the waves and group of waves that, without doubt, this means that the (moving) positions of the outer planets are of great importance to our continent. Hereby our hypothesis that the quality of our existence, as far as this is influenced by wars, improves during the rising and gets worse during the declining phase of the cyclic indexes, is tragically confirmed in an ample and extremely consistent way. For most wars it is difficult to establish exactly how many victims have been killed. The estimated number of victims does, however, give an indication as to the seriousness of the conflict. The division of these wars into categories of increasing malignancy will not lead to any problem. All the background historical facts, which could also have been of value to this study, have been excluded. For instance, we know that for the duration of the almost 3 centuries covered in this research, the world population has multiplied eight-fold. (McEvedy and Jones, 1980). The method of waging war has also dramatically changed in these three centuries. Whereas trained professionals of a limited number still practiced the art of war in the 18th century, whole peoples’ armies arose after the French Revolution. Through the Industrial Revolution these armed ranks were transformed into a war-machine, whose victims were counted in millions. In spite of this painful deflation of human dignity it did not seem advisable to me to adjust the categories through, for example, increasing the threshold value for great wars of the 20th century. Nevertheless, the results emerging from this study are clear. I find it moving and inspiring to know that we are so closely connected with the furthest reaches of our solar system. It is clear where our weakness lies: our culture is not attuned to an excess of incoming planetary phases. If we see the outgoing and incoming half of a cycle as a day and a night half, then we are obviously scared in the dark. That this can lead to panic reactions is apparent from this research. In case the results of research are not immediately clear, it is often necessary to submit them to strict tests and, if possible, to repeat the research with new material. However, my research included all the wars from 1700 onwards listed by polemologists. The fact that all three waves, each with their own rhythm, are related to the outbreak of wars is a triple confirmation of the hypothesis. Another objection from the sceptics was the limited number of wars, too few for statistic analysis. My comment that the quantity of deaths was more than enough was ignored. Anyway, a statistician from the Central Planning Bureau, an economic advisory body of the Dutch government, together with his team, discovered quite a few significances. In his opinion it was not necessary to make a statistical analysis since the facts were self-evident. I seemed to have reached a dead end with my research. The only sceptic to show any appreciation for my results was the astronomer Professor Dr. Willem de Graaff. In answer to a request from a Dutch astrological magazine he wrote: “Indeed the results of Doolaard’s research are very impressive; he has provided excellent evidence.” (Doolaard 1999). His only criticism was in regard to the 30 Year War (1618-1648) although this happened before the time span of my research. He found that this war had no relation to the outer planets and therefore cautioned for a measure of reticence. The following list of wars demonstrates that also this war has a strong link with the three waves, characteristic for mega-wars. I had not included these wars in my original research since I found 7 great wars in two centuries rather few. It is unnecessary to relate that the Jupiter-wave stands out, as does the Peasants’ War. In 1997 I published Universal History an 3000 year (612 BC-2400 AD) overview of all the aspects made between Uranus, Neptune and Pluto, in which also all the Saturn-Jupiter conjunctions are noted. In addition those periods in which the waves I use jointly rise or descend, e.g. during World War 1 and World War II, supplemented with the most important cultural and political periodization and notes (280) for the period 620 BC to 2000 AD. All the cyclic data from my whole book are condensed on a scheme on one page, in colour, which is available on demand. In 1999 I enjoyed an interesting correspondence with Professor Suitbert Ertel. He proposed testing my material by repeatedly allowing the wars to break out a year earlier and later and then to see what remained of their relation to the three waves. Since the period is one of 300 years, this would mean I would have to repeat my research 300 times. If a relationship was not rivalled or surpassed then my conclusions would have to be taken serious. In fact it is clear that I can slide as much as I want but I cannot get the three mega-wars (World War I, World War II and the Napoleonic Wars) simultaneously in the positions where all the waves descend, in other words, it is like a key which only fits the matching lock. In response to Ertel’s proposal I made a graph which shows how many wars break out in relation to the diverse waves if I let them break out from 1 – 6 years earlier and 1 – 6 years later (see fig. 9). The three graphs on the left side show how many wars break out during the descending wave phase and those on the right how many wars begin during the rising phase. In the first graph the line positions under the number 0 correspond to the real situation. You can see on the corresponding numbers on the vertical axis that at that time 20 of the 22 mega-wars break out. If we let the wars break out 1½ year earlier then there are only 11, exactly what you would expect were there no correlation. If we let the wars break out a year later then nothing changes. This is because wars usually last longer than 1 year. After that the descent begins. After 4 years you arrive at the expectancy rate, from which can be concluded that wars on average last 4 years. In the actual situation all the waves are much above the expectancy rate. The reason why the Jupiter wave peaks so sharply is that this is the most rapid wave of all the various waves, and therefore functions as a trigger. The dark columns in the middle show the percentage of casualties in total, per wave. At 100% the columns would reach the top. The 3 graphs to the right show the same image but during the ascending wave phases. If there was no correspondence then all the waves would be round the position of the line of expectancy rate. The vertical columns would also end in the vicinity. The contrast between the left and right graphs shows the extent to which the hypothesis is confirmed. This includes 82% of all war victims who died in all the wars of the past 300 years. These graphs were inspired by the proposal of Suitbert Ertel, for which I would like to express my thanks. One of the most important reasons that some scientists take a highly critical position towards my research is an objection to historicism, expressed by Karl Popper in The Open Society and its Enemies (1945) and in The Poverty of Historicism (1957). Campion’s The Great Year (1994) shows that in western civilisation, for thousands of years, historicism was rule rather than exception in western thought. Historicism assumes that the historical process operates according to underlying laws. This has led to the growth of several authoritative systems of thought which have had a disastrous influence on history. 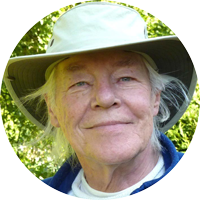 Nevertheless, mundane astrology, seen from a historic perspective the mother of all astrology, with André Barbault as the modern founder, has in my opinion less to do with historicism than is evident at first sight, for two important reasons. The first is that the relationships that are shown in this research cannot be seen as ‘underlying laws’ because laws tolerate no exceptions. The second is that the relation has been demonstrated, which is not the case with historicist theories. Mundane Astrology, apparently a historicist heresy, has a special position. That does not diminish the fact that this study is an ode to classical philosophy and what there the consequences will be is hard to imagine. Let us not forget there have been also periods of peace, as seen in Fig. 1 as well as in the 3 graphs at the right of Fig. 9. From 1720 till 1734 we find ourselves in the middle of the Rococo, a peaceful, natural and feminine style (Tansy, 1996). Also the last 2 decennia of the 19th century are well known for their peace, prosperity and optimism. The second half of the 1990’s brought the further integration of Europe and the New Economy Boom. But the best has still to come: between 2025 and 2042, not only all the waves will be ascending simultaneously, but also there we arrive in the second part of the prolonged sextile between PL and NE, accompanied by waxing sextiles and trines to UR (Doolaard 1997). These three ingredients of peace, cultural fertility and enlightenment will be active simultaneously. That never happened before (since 600 BC). If I could quantify peace, I would have written Waves of Peace instead. 1. Under Great Wars I refer to those wars, which sadly result in more than 100,000 victims, last no longer than 10 years and that cause per year at least 25,000 deaths. Thus a war with 110,000 deaths in one year (No. 50) is included on the list, whilst the Northern War between Sweden and Russia from 1700- 1721, with 382,000 victims, is nevertheless placed in the group of medium-sized wars, due to the annual norm. If we do not know in which years the fighting was at its fiercest, it has little sense to compare it to the cyclic index. For the group of 22 mega-wars, each with a million or more deaths, no limitations have been set. This group has such a strong link with all three cyclical indexes, that it was unnecessary to determine a sub-group. I have two lists of wars that I have compared with each other in various components. No single list is absolutely perfect but that from William Eckhardt is most extensive. I had to correct a couple of data. Sometimes a group of wars would be combined to a single war on one list, while noted on the other as separate wars. Seemingly everyone does as they see fit, because none of the compilers is fully consequent in this. For instance, Eckhardt reduces the diverse French Revolutionary wars (No.6) and also the diverse Napoleonic Wars (No.7) into single conflicts. Bouthoul, on the other hand, notes each of these wars apart, perhaps because he’s French. In other cases in which Eckhardt differentiates between wars, he unifies them e.g. no.28. For these two cases I have used Bouthoul’s list because they clearly belong (like 6 and 7) among the mega-wars when the death toll and impact are taken into consideration. I have also taken the two Balkan Wars, which took place in successive years, as one war (no.25) since, qua impact, they can clearly be counted among the great wars. I personally added the last four wars to the list (SIPRI and PIOOM-databank). Although some of these adjustments were unavoidable and others desirable, they have little effect on the final result. I have mentioned them only for the sake of completeness. The war in the Congo forms a notable exception. For the past 500 years no other mega-war has broken out in a period of rising waves. It could be argued that this war started much earlier than 1998 because several dozen warlords have been fighting each other since the civil war in Rwanda in 1994, and the fall of Mobutu. The battle for territory and raw materials continues. I have included this war in my list mainly because of the immense number of estimated deaths (1½ to 2½ million in 2 years). 2. I talk of predominance when three out of four positions are plus or minus. Only when both the Jupiter and the Saturn wave are in the same phase is that phase predominant. Half means that there are two possibilities, like fifty-fifty, + – or – +. 3. The following table shows how many years the Jupiter, Saturn and Uranus waves and group of waves are in the – or + phase for the period 1700-2000. (1963) Wat wacht ons nog in de komende jaren? Astrologisch jaarboek 1963. Bruna & Zoon, Utrecht, the Netherlands. (1990) “Histoire d’une Prévision” L’astrologue Vol. 89, Éditions Traditionelles, Paris. (2004) Introduction à l’astrologie mondiale, Éditions du Rocher, France. Bouthoul, Gaston et Carrière, René (1976) Le Défi de la guerre. P.U.F. France. Baigent, Campion and Harvey (1984 and 1992) Mundane Astrology. The Aquarian Press, London. Doolaard, Robert D. (1990-91) “The Pluto-Neptune cycles, the Power of Imagination” Astrological Journal. Vol. 33 No 5 and 6, Vol. 34 No 1 and 2. (An extract of Waves, Planetary Influences on Culture (600 BC – 2000 AD). Ankh-Hermes, Deventer 1986, in Dutch). Doolaard, Robert D. (1993) “Golven en Oorlogen 1700-1992”. Symbolon Vol. 3. No. 4, pp 3-12. Hamaker, Amstelveen, the Netherlands. Astrologie in Onderzoek (Astrology under Scrutiny) Vol. 8, No 1, pp. 15-22. Heukelom, Amsterdam, the Netherlands. Doolaard, Robert D. (1993) “Waves and Wars 1700-1992”. Astrological Journal Vol. 35. No. 5, pp. 268-279. Doolaard, Robert D. (1999) Het Aristarchus van Samos effect, AstroFocus nr. 3, 1999, pp. 4-15, the Netherlands. Doolaard, Robert D. (1997) Universal History A chart of 3000 years with the NE, UR, SA and JU waves and aspects, related to political and cultural periodization and events. Published and printed in colour by the author. Ram, Th.J.J. (1935) Psychologische Astrologie. Amersfoort, the Netherlands. Tansy, R.G. and Kleiner, F.S. (1996) Gardner’s Art through the Ages. Harcourt Brace College Publihers, U.S.A.
Thierens, A.E. (1933) Elementen der Practische Astrologie. the Netherlands.